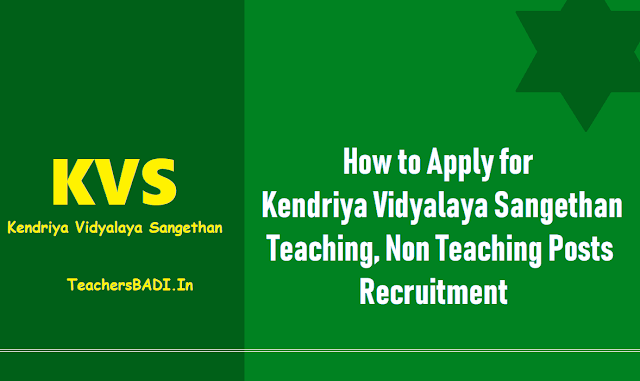 How to apply for KVS Teachers Recruitment 2018 (KVS Principals, PGTs, TGTs, PRTs): Candidates awaiting Kendriya Vidyalaya teacher recruitment process should note that online registration portal to be opened. The recruitment for KVS Principals, PGTs, TGTs, PRTs. Official notification is available at the website kvsangathan.nic.in. Candidates shall have to register for the recruitment at cbseitms.nic.in. Note: The number of vacancies indicated above is tentative and subject to changes. PGT (English, Hindi, History, Economics, Geography, Physics, Chemistry and Maths): Two Years' Integrated Post Graduate M.Sc. Course of Regional College of Education of NCERT in the concerned subject or Master's Degree from a recognized university with at least 50% marks in aggregate and B.Ed or equivalent degree from a recognized University. The age limit for the recruitment is 40 years. TGT (Hindi, English, Sanskrit, Social Studies, Maths and Science): Four years integrated degree course of Regional College of Education of NCERT in the concerned subject with at least 50% marks in aggregate or Bachelor's Degree with atleast50% marks in the concerned subject/combination of subject and in aggregate and CTET Paper 2 pass. The age limit is 35 years. Primary Teacher: Interested candidates must be Class 12 pass from a recognised state board or university with 50 per cent marks and CTET pass. Applicants must have proficiency in teaching in both English and Hindi medium. Application fee: All the candidates need to pay Rs 750. The registration process for Kendriya Vidyalaya teacher recruitment 2018 to be started on the official website, the link for which is kvsangathan.nic.in. The recruitment will be for the states of Assam, Meghalaya, Arunachal Pradesh, Nagaland, Manipur, Mizoram and Tripura. Note: Candidates can also apply directly on this website .